In October we’re reading Art & Philosophy, the first chapter of Alain Badiou’s Handbook of Inaesthetics, which links up with and extends our previous discussions of Jacques Ranciere, Boris Groys and Susan Sontag. This discussion will be chaired by Kerry W. Purcell. DOWNLOAD: Badiou, Alain (2004). Art & Philosophy. In Handbook of Inaesthetics, trans. Alberto Toscano. Stanford: Stanford University Press, pp. 1-15. 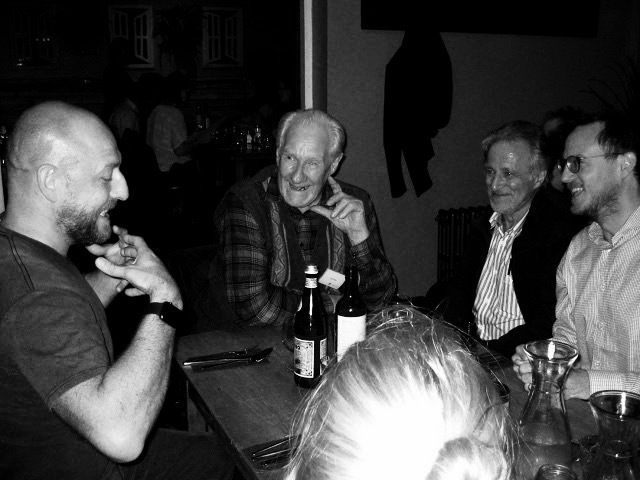 Alain Badiou and Kerry W. Purcell have lunch in 2015. What constitutes an artistic Event? What does it mean (phenomenologically) as a ‘subject’ to experience such an Event? How do we think “change” within art history? By their very nature of being something radically new, are all artistic Events “abstract” (this is one of Badiou’s contention)? How do artists/historians name what (the early) Badiou termed ‘infinity points’ in the historical discourse of art? What happens when an artist betrays the ‘revelation’ offered by an epistemological rupture? Following Badiou, how do we think ‘truth’ within art? Shaw, Devin Zane (2007). Inaesthetics and Truth: The Debate between Alain Badiou and Jacques Ranciere. Filozofski vestnik Vol 28/2, pp. 183–199. Tutt, Daniel (2011). Art and Philosophy in Badiou’s Handbook Of Inaesthetics.